It is already common knowledge that individual investors do not usually have the necessary resources and abilities to properly research an investment opportunity. As a result, most investors pick their illusory “winners” by making a superficial analysis and research that leads to poor performance on aggregate. The Standard and Poor’s 500 Index returned 7.6% over the 12-month period ending November 21, while more than 51% of the constituents of the index underperformed the benchmark. Hence, a random stock picking process will most likely lead to disappointment. At the same time, the 30 most favored mid-cap stocks by the best performing hedge funds monitored by Insider Monkey generated a return of 18% over the same time span. Of course, hedge funds do make wrong bets on some occasions and these get disproportionately publicized on financial media, but piggybacking their moves can beat the broader market on average. That’s why we are going to go over recent hedge fund activity in ADTRAN, Inc. (NASDAQ:ADTN). Is ADTRAN, Inc. (NASDAQ:ADTN) a bargain? Investors who are in the know are categorically actually taking a pessimistic view. The number of long hedge fund bets that are revealed through the 13F filings were cut by 2 lately. 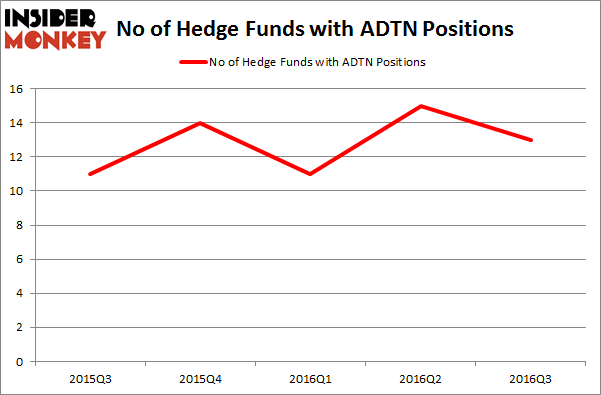 There were 13 hedge funds in our database with ADTN holdings at the end of September. The level and the change in hedge fund popularity aren’t the only variables you need to analyze to decipher hedge funds’ perspectives. A stock may witness a boost in popularity but it may still be less popular than similarly priced stocks. That’s why at the end of this article we will examine companies such as 1st Source Corporation (NASDAQ:SRCE), Express, Inc. (NYSE:EXPR), and Isle of Capri Casinos (NASDAQ:ISLE) to gather more data points. How have hedgies been trading ADTRAN, Inc. (NASDAQ:ADTN)? Heading into the fourth quarter of 2016, a total of 13 of the hedge funds tracked by Insider Monkey were long this stock, down by 13% from the second quarter of 2016. On the other hand, there were a total of 14 hedge funds with a bullish position in ADTN at the beginning of this year. So, let’s find out which hedge funds were among the top holders of the stock and which hedge funds were making big moves. 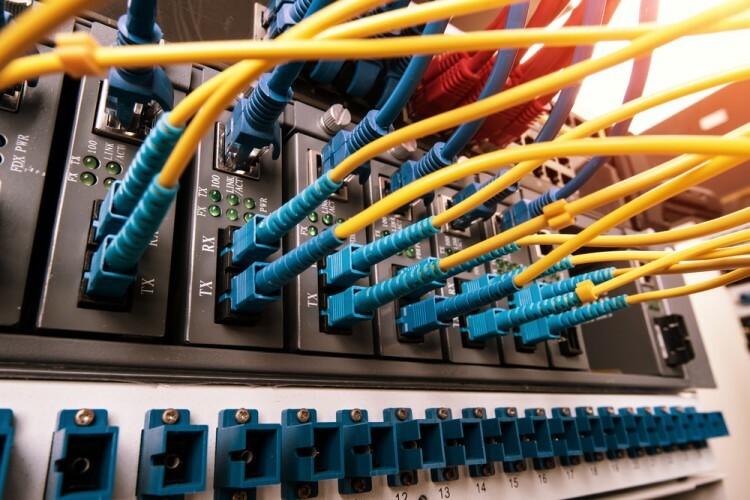 Of the funds tracked by Insider Monkey, Renaissance Technologies, one of the largest hedge funds in the world, holds the number one position in ADTRAN, Inc. (NASDAQ:ADTN). Renaissance Technologies has a $23.9 million position in the stock. Sitting at the No. 2 spot is Arrowstreet Capital, led by Peter Rathjens, Bruce Clarke and John Campbell, holding a $11.4 million position. Remaining members of the smart money that hold long positions consist of Anand Parekh’s Alyeska Investment Group, Chuck Royce’s Royce & Associates and D. E. Shaw’s D E Shaw. We should note that none of these hedge funds are among our list of the 100 best performing hedge funds which is based on the performance of their 13F long positions in non-microcap stocks. Is Super Micro Computer, Inc. (SMCI) a Good Stock to Buy? Is B2Gold Corp (BTG) A Good Stock To Buy? Do Hedge Funds Love Sterling Bancorp (STL)? How BOK Financial Corporation (BOKF) Stacks Up Against Its Peers How Bridgepoint Education Inc (BPI) Stacks Up Against Its Peers Is CAE, Inc. (USA) (CAE) A Good Stock To Buy Right Now?